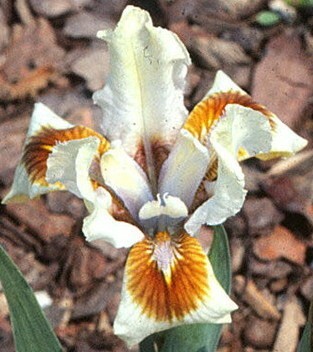 'Persian Doll' (Lucille Kavan, R. 1969). Seedling #51-67. MDB, 8" (20 cm). Color CodeW1cm. White flared self; brown halo at haft; blue beard. 'Patsy Jo' X 'Knick-Knack'. Melrose Gardens 1980.